Click on the download link below and fill out the application form to join now! Camp More – Save More – Enjoy More! As a Public Benefits Member, we would like to provide you with the tools you need to get away more often, without it costing you a fortune. Together with the Camp & Live Annual Camping Guide and Southern Africa's Caravan & Camping Tourism Network you can now Camp More – Save More – Enjoy More! Join today and enjoy super discounts and great benefits! The CaravanParks.com Camp & Live Annual Camping Guide. Our Super Specials newsletter includes resort specials and dealer discounts, as well as other interesting articles from our online Forums. These Super Specials will allow you to get out and camp more often at discounted rates and get super savings on all your camping gear. DASHBOARD on CaravanParks.com, where you are able to have your own Profile, keep track of all your Forums, Classifieds, Statistics, Customer Feedback for Resorts and much more. Our CAMPendium Activity Box. Fun for the whole family! 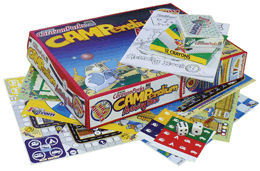 Includes 6 custom board games with tokens and dice, Activity Book and crayons and a Special Edition Green Deck of playing cards. Blue and Red Decks of playing cards, to complete your set. Special Invitations to all the CaravanParks.com Rallies. Plus much more throughout the year. All this for only R60.00 per month! Yes! I would like to join today! To join the Public Benefits Membership is as simple as replying to this e-mail by "clicking" on YES! Complete the reply e-mail with your contact details. You will be sent an application form from us. Please complete the form and send it back to us. If you have any queries, please call us on 033 326 1370. You can visit our Public Benefits Page, where you will find a downloadable application form. Please note that this offer is only available to South African residents. I just want to say I was again very surprised by the useful, colourful goodies that I have received. I can't wait to open your packages and every time it feels like my birthday! We enjoy camping and with your goodies and "Camp & live" - it just becomes more and more fun.With sincere appreciation. Thanks again for the wonderful camping recipes book, I can't wait to try it out next time we go camping, it's so handy.